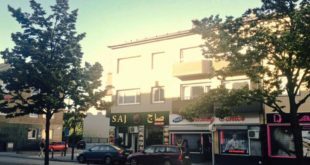 The first visit to Zakariah Street had already left a lasting impression on me. So much so that I planned to return back to Zakariah Street in search for more. It was the return of the faithful to the food hub once again. This time I had decided on reaching there a little later, after the Iftar meals were over. 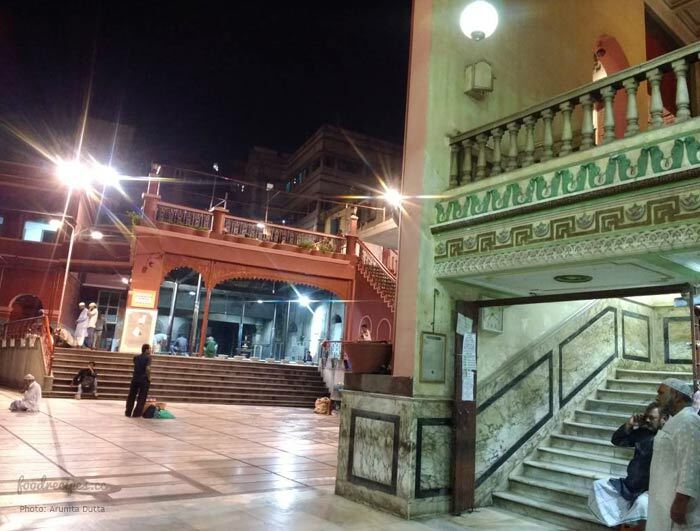 So on the evening of Chaand Raat (the night of the new moon sighting) declared by the grand Mufti of Saudi Arabia after the Namaz-e-Maghrib, I ventured out again. In India Chaand Raat would be observed a day later before Eid was celebrated and the month of Shawwal began. Being the last day before Chaand Raat, the excitement was palpable. Post Iftar the place was overrun by swarms of people in spite of the heavy showers minutes before. I was surprised to see many people from other faiths too, milling around for the Ramadan goodies. 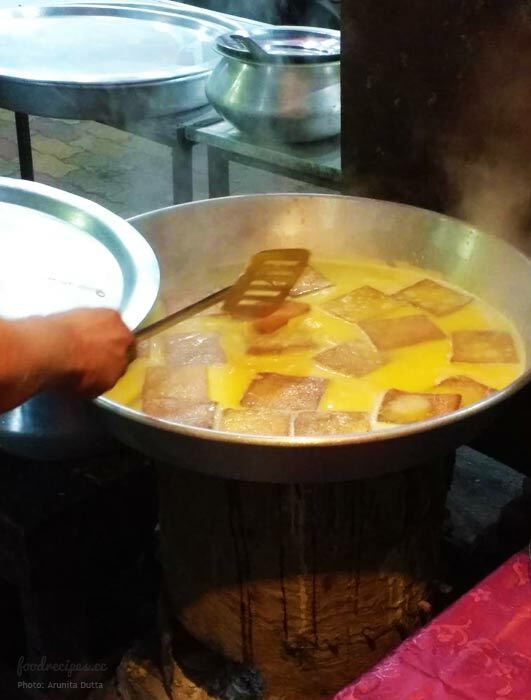 Clearly Zakariah Street had reached out to the gastronomically charged in the city. I was happy to guide a gentleman visiting with his wife and little son to the stall hugely popular for Murgh Changezi and Mahi Kebabs. It felt good to act as an impromptu guide who was returning for a closer inspection of the things she had missed earlier. The first stop was the place selling Pyare kebabs. Unfortunately I was asked to return after half an hour since they were sold out already, being one of the most sought after kebabs at the venue. Patience has to be one of the greatest virtues as patience did finally yield the Pyare. 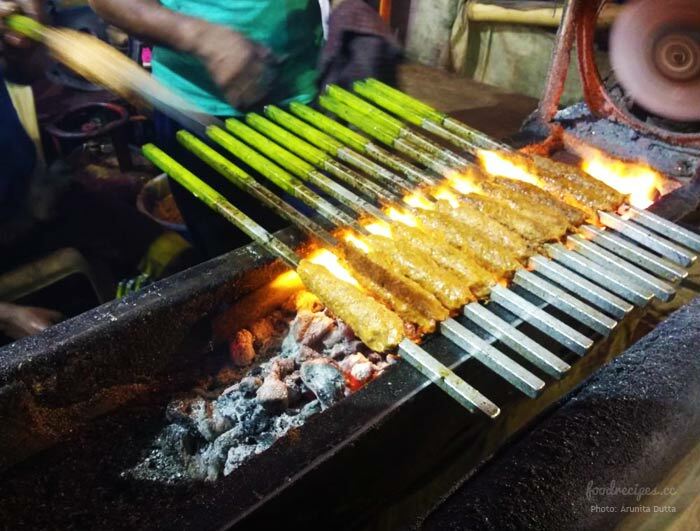 They were the best melt-in-the-mouth kebabs I had ever tasted. 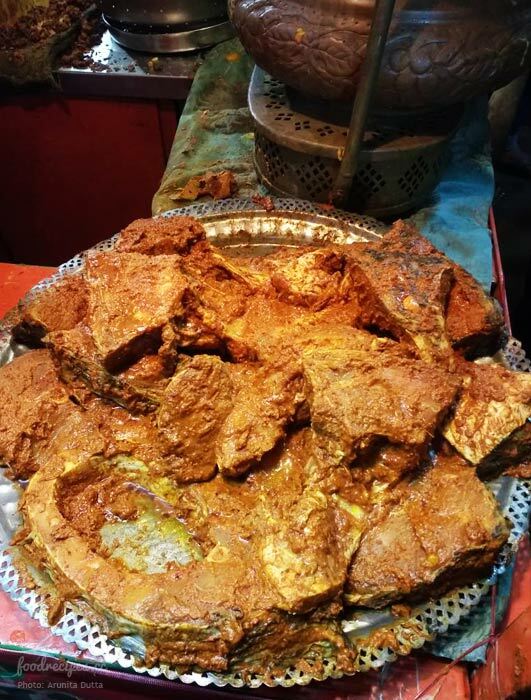 Story goes that when the ageing Awadhi emperor Asad Ud Daula lost his teeth, the expert raqabdar Haji Murad Ali in the royal kitchen prepared a kebab by pounding the meat for hours, so as to make it soft enough for consumption without chewing. 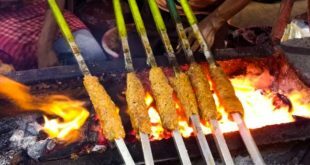 The result was the genesis of the famous Galwati or Galauti Kebabs of Lucknow which could be eaten by the toothless emperor. Later under the aegis of an insulted local aristocrat, probably Nawab Syed Mohammed Haidar Kazmi, who wanted to undo the allegations levelled by visiting British officials on the quality of allegedly tough Sheekh kebabs served to them, these evolved into the famed Kakori kebabs, where the severely pounded mince was wrapped around skewers and cooked over burning charcoal. The Pyares here resembled the latter and melted in my mouth in the same manner as they must have in the past. I hardly had to use my still intact dental appendages. 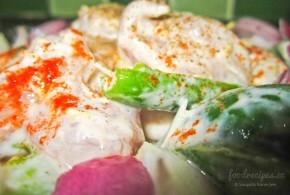 I walked on and stopped at the stall selling Afghani Chicken kebabs. 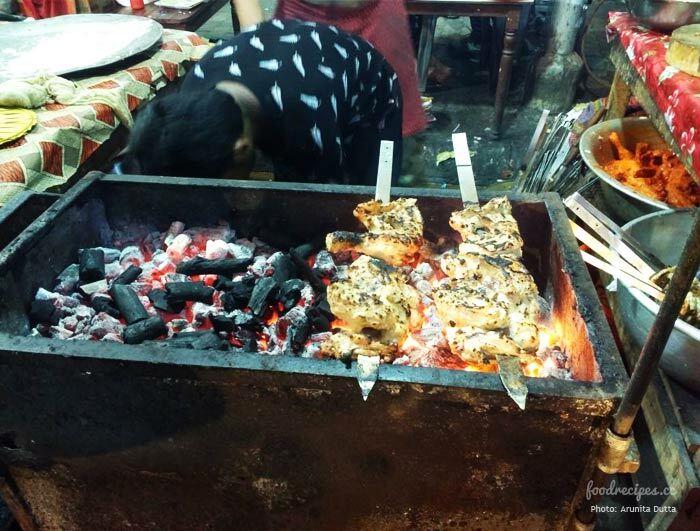 There were these huge quarters of chicken marinated either in a spicy chilli mix or in a paler yogurt marinade, skewered through and placed over charcoal fire. They were succulent and simply unbelievable. Forging ahead I was trying to find my way to a particular hotel, but I lost my sense of direction amid the numerous stalls selling crisp white cottons to fancy watches. 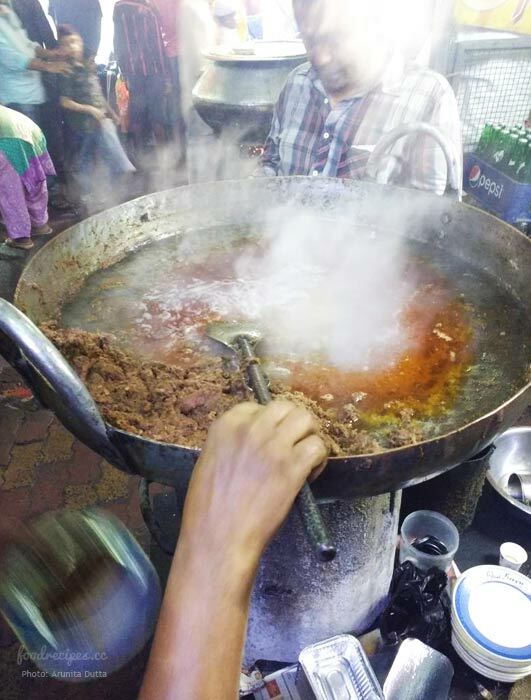 Finally I did with the guidance from the stall owners and there I was for it’s super tasty Beef Chaap. These were boneless meat, marinated overnight with spices which were not overwhelming on their own and rightly imparted a subtle taste, while still retaining the meat’s inherent flavour. As usual they too were cooked over a slow flame for literally eons. The chaap left an indelible mark in me. 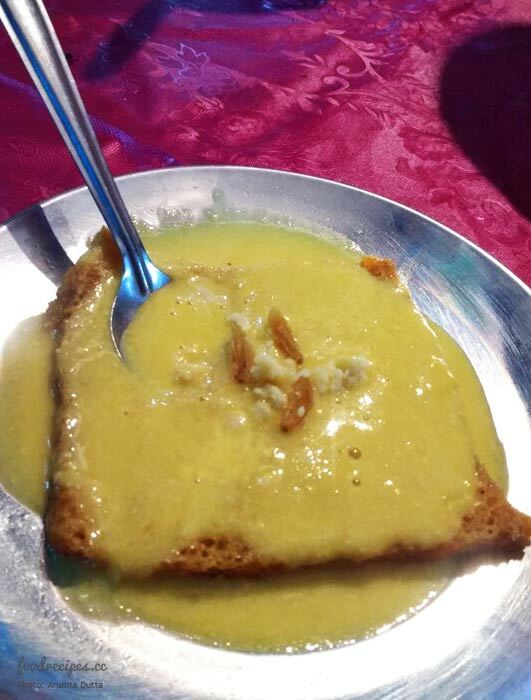 With enough meat in my system I set my eyes for Shahi Tukra once again. This time my target was different. 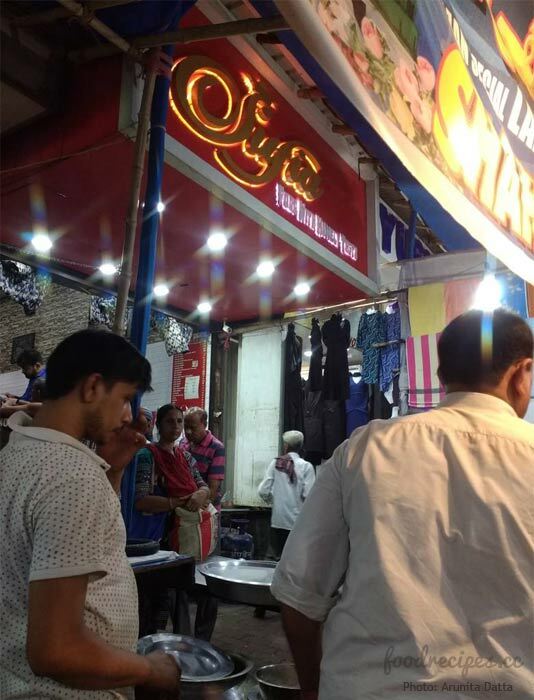 A person guided me to an empty stall in front of Sufiya Hotel where a bare wooden table stood, with the banner Lakhnawi Shahi Tukra written on it. A middle aged man looking more like an Afghan, sitting on a lone chair at the table, stood up and offered me the seat. Chivalry still exists I guess. This was Wajid Ali Khan, who sold these Shahi Tukras here. 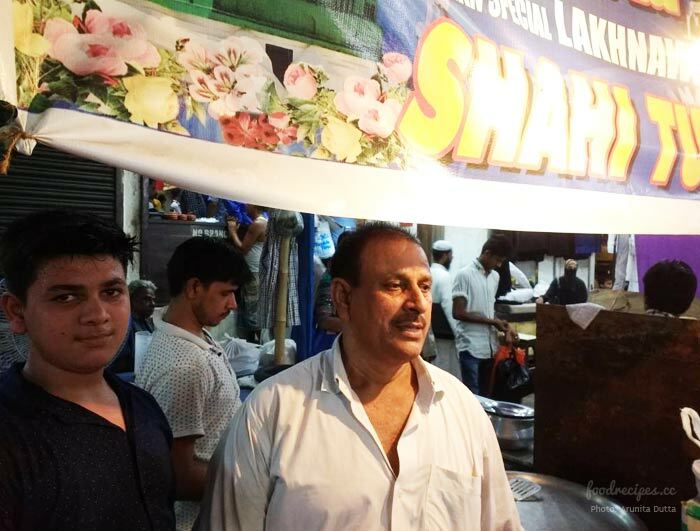 He resides in Gazipur, Uttar Pradesh and had been coming to Calcutta for the last four years to stay and sell his Shahi Tukras here at Zakariah Street. His elder son being at Saudi Arabia, he was in the city with his school going very handsome younger son, Amir Khan to help him with the business. At first water was boiled and in it milk was poured. 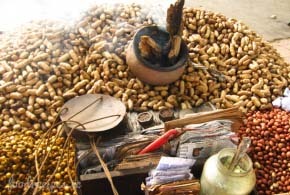 Sugar was added later along with more cold milk to bring down the temperature. Then a little saffron was added for colour and the bread slices, already fried in Ghee were dropped in it. 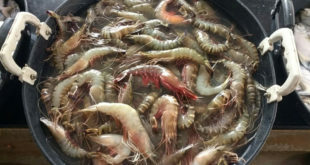 They were gently nudged around so as to soak up the liquid and then covered and removed from the fire and allowed to steep in the warm dilute milk. Impatience on my part had to be curbed and I waited. After about 5 minutes which seemed like a lifetime, the lid was opened, revealing the swollen bread slices which seemed to have increased in size manifold. The dilute milk was gently squeezed out of them and each bread slice was placed on individual plates. 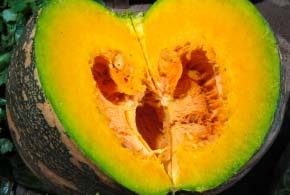 A pre prepared thick, lightly sweetened milk was poured over it. Mewa, raisins and almond shavings were sprinkled and I was served my portion. The spoon cut through the bread like a knife going through soft butter. I put the first spoon into my mouth and it was Jannat. This had to be the food of the Gods. The bread was still not soggy and had retained a hint of crispness in its core, the thick milk had a mild sweeteness, just right for second, third and innumerable helpings and the flavour perfect. 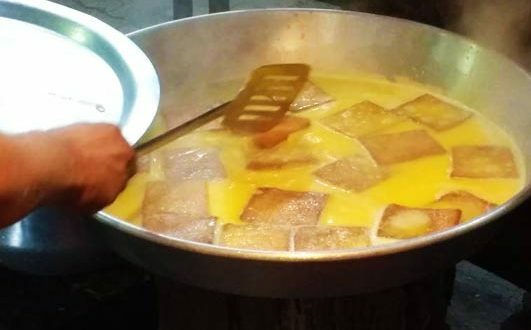 As it permeated deep within, very slowly, I remembered John Denver’s Annie’s Song of 1974, one of my favorite songs from the past, “you fill up my senses”…only this time “you” was Wajid Ali Khan’s famous Shahi Tukra! Eid was arriving too early I felt. 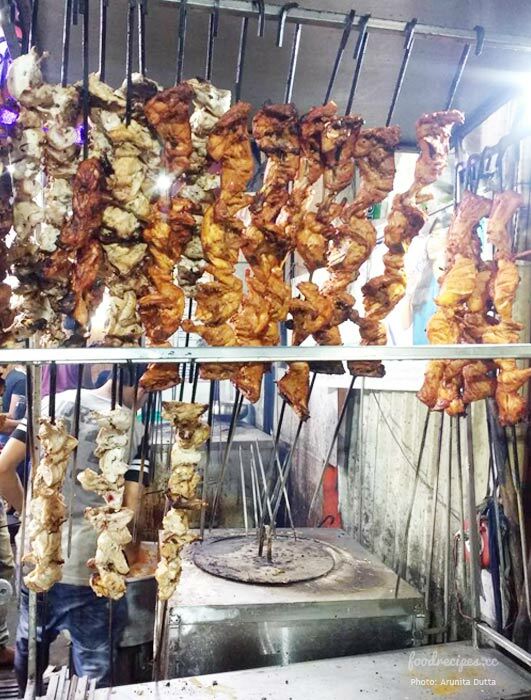 If only the month of Ramadan stretched on, if only the Pyares, the Afghani Chicken Kebabs, and Wajid Ali Khan stayed back at Zakariah Street for some more time. If only “wishes were horses, beggars would ride”…. The good times here at the food street were ending fast and how and it would be a long wait till the next one again. 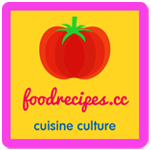 Arunita Datta is a teacher by profession with an avid interest in culinary culture of any place under the sun. 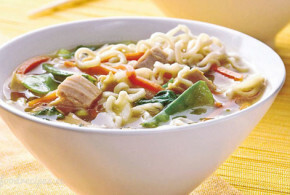 Cooking and chronicling her efforts and experiences have been one of the most favourite hobbies of her. She loves to collect recipes and tries them out periodically. Good old “adda” sessions with home cooked food is her all time favourite.